The popularity of roller coasters has spawned a huge market for roller coaster games. RollerCoaster Tycoon 3 is completely updated and redesigned to take the series to all-new heights. Featuring overhauled 3D graphics and the exclusive new Coaster Cam, you can now see your park from any angle and ride the coasters you build. From street level to blimp, see your park pulse with fun and excitement like never before. Features include an enhanced user interface, complete camera control, and the ability to light up the night with the new park lighting system. The game stars a huge array of diverse guests and you can even create your own family members and friends and add them to your park. Create pyrotechnic wonders with the new Fireworks MixMaster, build your dream park with unlimited funds in "Sandbox" mode, and add music to rides and fireworks shows from your own mp3 library. Five themes are available: Generic, Spooky, Western, Adventure and Sci-fi. This compilation of RollerCoaster Tycoon 2 and expansion packs Time Twister and Wacky Worlds brings together all the rides, building tools, as well as five real-world Six Flags amusement parks and 25 of their signature coasters. Build your coasters in international locations, including the Great Wall of China, the Eiffel Tower and the Grand Canyon. You can even build theme parks in different historical time periods, such as the Jurassic period or the golden age of Rock & Roll. Atari’s popular ROLLER COASTER TYCOON 3 for the PC goes gold with ROLLER COASTER TYCOON 3 GOLD, a re-release of the original that boasts a smaller price without losing any of the great roller coaster fun. The ROLLER COASTER TYCOON series puts gamers in control of their own amusement park. Here, they will be able to decide on the theme of the park, the number of rides, the location of food stands, and many other different decisions that all must come together in harmony to make the visitors happy. If visitors aren’t happy, they will stop coming back, which will cause the park to lose money and, eventually, force players into bankruptcy. Gamers familiar with the series will find that visitors are much more vocal this time around, but it’s also easier to determine their specific complains. ROLLER COASTER TYCOON 3 introduced several new elements to the game. One was the ability to create fireworks displaying using custom music. Using the Fireworks MixMaster component, players can import their own music files and time a number of different fireworks to go off during the song. The game has several modes. Gamers can start their own theme park, load a scenario and take over an existing park, or use the sandbox mode to build their dream park with unlimited funds. All three modes offer hours of gameplay and different challenges. All of these great options combine to make ROLLER COASTER TYCOON 3 GOLD an amazing, fun game. Includes all the fun and creative experiences offered in the original RollerCoaster Tycoon and its expansion packs, Corkscrew Follies and Loopy Landscapes. Choose from a huge variety of coaster types with giant loops and barrel rolls and incredible in-park attractions like suspended monorails and water soaked plume rides! Clink. . .Clink. . .Clink. . .Clink. . .Wheeeeeeeeee! Whooooosh!!!! Zip! Zoom! Dive! Climb! Loop! This Run Away Award Winner offers Roller Coaster excitement for the whole family! Build a monstrosity of a model. 6 1/2 feet long, 2 1/2 feet wide, 3 1/2 feet tall. Styled just like today's steel style roller coaster. Assemble this fast action replica and duplicate twists, turns, loops, and cool styling. Seat your passengers. Turn on the motor and generate excitement. Realistic sounds, motorized action, speeding cars. Your adrenaline rushes, your heart pounds, your stomach catches in your throat, and you can't wait to go again. K'NEX builders and thrill seekers will feel the hair on the back of their necks and goose-bumpson their arms rise high with the newest addition to K'NEX Thrill Ride series - the K'NEX Vertical Vengeance Coaster. The giant coaster features K'NEX's brand new micro parts for bigger-building fun and measures over 5 feet tall. The building set includes a vertical, motorized chain lift that carries two coaster cars all the way to the top. The cars then race down 33 feet of track through loops, turns and spirals. To make the ride more realistic, the kit comes with coaster sounds and screams. Step-by-step instructions are included, with each broken down to translate the 3D result into a 2D visual that is easy to understand. The set includes a part organizer for easy sorting and storage. Designed for children 10 years and older. Requires two AA batteries for motor and sound effects. 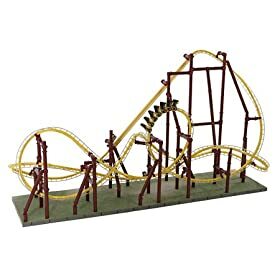 In pushing the envelope of what is currently available for modeling roller coasters, CoasterDynamix has focused on the best way to design and produce a high quality roller coaster model that is infinitely modifiable, visually accurate, easy and quick to assemble, expandable and just plain fun!